Collioure. Not a bad place for a coffee! 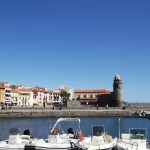 Collioure is famed for being one of the places Picasso chose to live and paint. When I was first told of this jewel in the Mediterranean my instinct was to run! The words, “it gets pretty busy with tourists” are a red flag to me. More one to saunter aimlessly and stop frequently for refreshments, the idea of bustling streets anywhere other than where it should be, like a morning market, has me quaking in my flip flops! 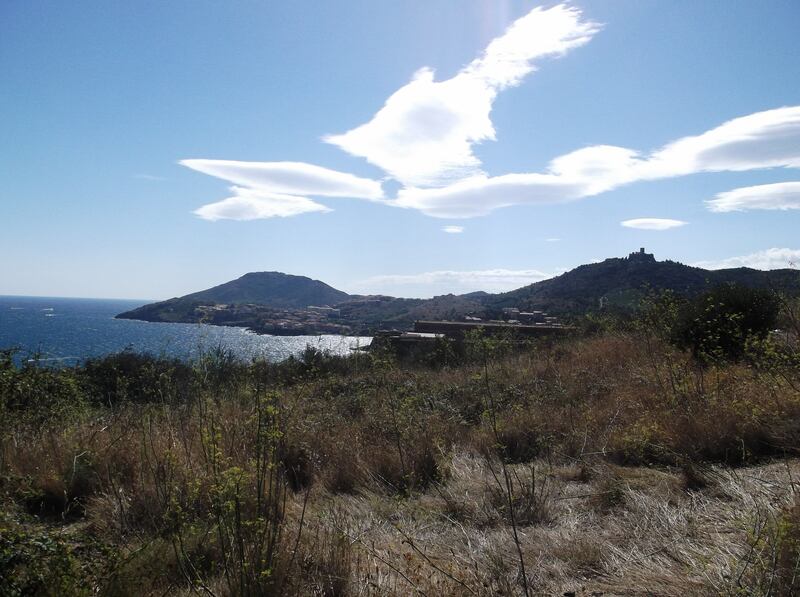 Although it was not my intention to go to Collioure, I am glad that my daughter had a “moment” in neighbouring Argeles Plage on the day in question which forced me to vacate the locality rather rapidly. My plan to drive to Spain was also thwarted as I knew it was going to be a very hot day and a temperamental Lola in the car does not make for ideal driving conditions! I am lucky, I am able to take my daughter travelling outside of the school holidays; not only does this make it much cheaper but it also means we miss the swarms of crowds that infest these tourist traps in the height of summer. I don’t mean to refer to the tourists as insects but it gets the point across doesn’t it? I can’t imagine how this pretty little spot in the South of France would be in the high season. Even in mid September the narrow streets were busy; the queues for ice cream and coffee were not too bad but this was fairly early in the day. 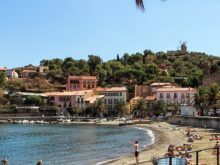 Rather than spill all of the beans in this article I shall first tell you how to get to Collioure, it’s easy to get to and despite my reference to the crowds it really is a little beauty of a place that you will enjoy I am sure. The town can be found on the coast between Perpignan and Spain, the Pyrenees in sight as well as the beautiful turquoise of the Mediterranean sea. We were staying at Canet Plage, Mar Estang holiday park with Al Fresco holidays, the drive is only around 20 minutes and you can’t really get lost. If you are coming south you will want to be on the D914 which comes out of Perpignan and take exit 13 to Collioure and Port Vendres. You will go around a roundabout before starting to descend into the town. Very soon you will see a sign on your right for parking at the top of the hill, my advice (if you able to walk well) is to park here and walk into the town. You will get the opportunity to walk up to the cliffs and take in the view before you head down to the town itself. View from the car park at Coullioure. One of many! From Spain it will depend on whether you are prepared to drive the coastal route (which I thoroughly recommend). This route changes from the N260 (Spain) to the D914 as you cross into France. It is a stunning drive but very twisty. From Barcelona you would head to Figueres then take the N260 to Llanca before following the road to France. Of course you will need to get off at exit 13 again to drive into Collioure and follow my previous instructions. For those who prefer the fast lane, stay on the AP7 or the N11 until you reach Le Boulou, here you will take the D618 towards Argeles sur Mer before joining the D 914 and following the route described above. Here is a map of all routes courtesy of google maps. The walk from the car park is down a steep hill but I did it with a 3 year old in 30 degree heat so challenge yourself! There is parking in the town but it is limited and more expensive, of course if your legs aren’t as good as they once were this would be the sensible option. As you approach the narrow streets you will be struck by the colours of the architecture and the nature of the traders. There are many artists both resident in shops and lining the waterfront but what else would you expect in such a location? My advice to you is to make sure you wander those streets, walk around the whole of the waterfront not just the obvious hotspots. Lola and I found a back street patisserie with great cakes where the obligatory ham and cheese baguette was considerably cheaper than the centre of the town. There wasn’t a queue either! You may be gathering that I am not one to follow the crowd. My life with Lola is all about making the most of the small things and creating memories. If there is a beaten track, I will not be found on it, I will be walking or driving in the opposite direction! This approach allows us to find little treasures that are left of the travel guides, it’s also part of my bigger plan to find the place where we may eventually buy a little home. You see it’s all part of the journey we are taking – exploring and learning and hopefully inspiring others to do the same. 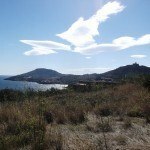 Thank you for reading, please comment or share below and pop over to the next post in this series Collioure – A Haven For The Creative Mind.